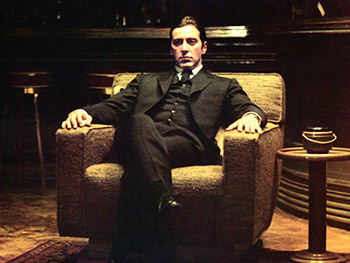 Tropes: Chiaroscuro, Slouch of Villainy, Sharp-Dressed Man, Dark Is Evil, Damn, It Feels Good to Be a Gangster! "While this has no plot bearing, Nanoha from Lyrical Nanoha is left-handed." —Example from the now-deleted page "Everyone Is Right Handed" about Lyrical Nanohanote which doesn't even have enough meaning to be The South Paw. Tropes are conventions used in storytelling to convey some sort of information to the audience. People Sit On Chairs don't convey any meaning — they aren't storytelling conventions at all, they're just things that happen normally or incidentally during the storytelling. So if somebody is calling your idea on the Trope Launch Pad a "chair" or "PSOC", this means they think your idea is about as meaningful as the discovery that various different shows portray people sitting on chairs: It doesn't matter how commonly it occurs, this is something that never carried any meaning to begin with, making it Not a Trope. The whole point of a chair, as Facebook so eloquently explains, is to give people something to sit on, but this by itself doesn't convey meaning. On the other hand, there are ways in which chairs can be used for a trope; perhaps we're talking about an impossibly awesome-looking chair (or a more functional Super Wheelchair); maybe it gets used for a Chair Reveal, or for the Big Bad to express his Slouch of Villainy. And maybe the chair is conspicuous by its emptiness. All these add some sort of meaning to the "chair" in question, which makes them legitimate tropes. Note that the criticism here isn't simply that the trope in question is "too common" or "too broad", as No Trope Is Too Common. There are some extremely common cliches, and Omnipresent Tropes, that appear in fiction maybe even as frequently as chairs, but these are still storytelling devices. For instance, there is The Couch, another item people sit on, but given a purpose that correlates with the visual layout of house floorplans. Conversely, a trope suggestion can still be guilty of People Sit On Chairs even if it doesn't literally appear all the time. Even if it is relatively rare, it can still be used without a narrative purpose. For example, there may be only three works of fiction in which a person walks down a street called Jameson Street, but unless that name has some relevance to the storytelling beyond just being a street name, it is People Sit On Chairs: there is no meaningful pattern or connection between these works. One good sign of a People Sit On Chairs idea is if you can't think of any examples that have meaningful context. Personal Appearance Tropes in particular are a constant source of this problem, connecting two things that are only coincidentally important or identifying a pattern that has no clear or consistent meaning or purpose. For this reason, we've been trying to clean them up . If you are really, really, really sure that we need this one, try to connect it to something meaningful (which doesn't necessarily have to be an element of the plot; it can work if the trope counts as Narrative Filigree or Garnishing the Story). Or if you can identify several narrative purposes for an element, you can propose it as an index. If not, you just need to accept that this trope page will never happen. If you're really not sure whether or not your idea on the Trope Launch Pad is People Sitting On Chairs, try asking "Is This Tropable?" See also Consistency (for the other aspect of defining a trope), Square Peg, Round Trope (when something is not an example of an otherwise real trope). Do not confuse with Seated Tropes (a list of legitimate tropes that just happen to involve sitting), or Averted Trope (there is an actual trope; it just doesn't show up in a particular work). No examples here, please. No, really, they're not necessary.